Let's face it some people are shower lovers others love their baths. 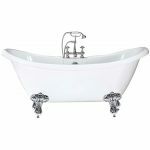 For the ultimate in opulence and bathing we present a range of high quality roll top baths. Single, double and slipper styles make up the range. These are made from a thick moulded acrylic that retain heat and because they're lighter than their traditional steel counter parts are easier to put into position. 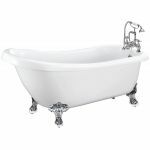 All models come with authentic claw and ball feet to really set the scene and give your roll top bath all the support required. Combine with attractive chrome exposed waste piping and perhaps a freestanding or deck mounted bath shower mixer to make topping up easy and help you soak an hour away.